I’ve come to the conclusion that I very rarely finish what I start. I wonder if I’ll ever actually finish any of these posts? Considering that Finish What I Start was sitting in my drafts folder for a good few days, the outlook is not good. Actually, that sounds pretentious and stupid. I’ll stick to calling you ‘dear readers’. Retrospect has been known to flicker in and out of vogue, and if current vibes are anything to go on, retrospect is making a comeback this season. Yes, that’s right ladies. Head to those cupboards and pull out everything that reminds you of the past, wear it proudly, and recall with a quiet smile just how different a person you would’ve been back then if you’d known what you know now. It’s like the eighties, but with less neon. So exactly what is it about retrospect that has critics going mad right now? Retrospect has a frightening tendency to rear its ugly head in the most bizarre situations, and usually to the most frustrating ends. Retrospect, I can find myself lost in your icy tendrils of recollection for hours. Especially when I should be studying. As a genre, cutesy music tends to be a bit ‘hit and miss’. Some bands pull it off well while others can be novel for a listen or two, but then make you want to hop on a tricycle and run over your own hands. 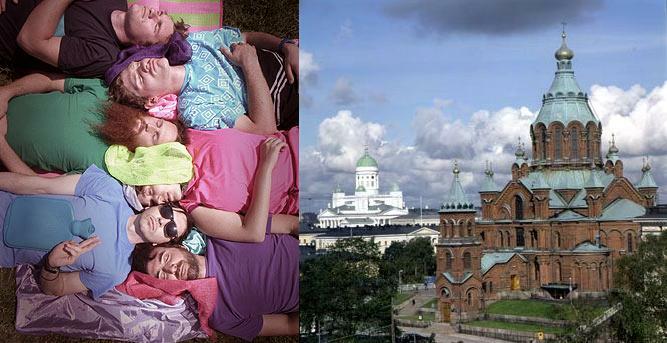 Architecture in Helsinki fall into both categories, flailing between the extremes energetically. People like Kimya Dawson tend to fall into the second category. Once again, I kind of like it, but then hate myself for it. Cutesy music, you confuse the heck out of me.